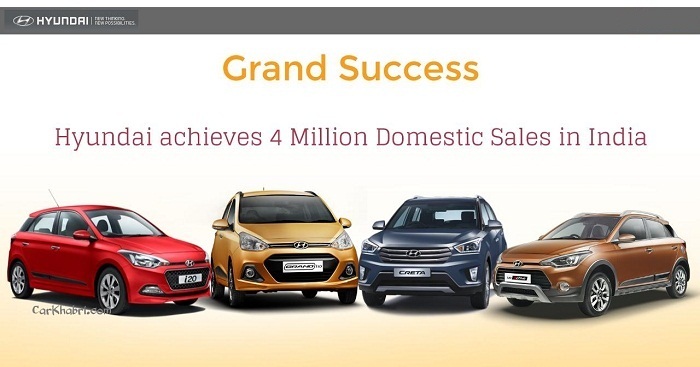 Hyundai Motor India has announced its achieved a milestone of selling 4 Million vehicles in Indian market. Recently just a day before Elite i20 one of the best selling hatchbacks from portfolio of Korean car maker also touched the mark of selling 1,50,000 units is Indian car market. Now with achievement of 4 million units the car maker has become the fastest growing automobile brand in India to achieve the milestone and the synonym to witness the success of "Make in India" slogan. The emergence of HMIL marked the beginning of new age in Indian car market which succeeded in winning the heart of Indian car enthusiasts with its origin. The Hyundai journey began in India 19 years ago with the launch of Hyundai Santro, India’s first tall boy design automobile which sown the seeds of it success in Indian Car Market. With the most successful launches of Grand i10, Elite i20, i20 Active and Creta, Hyundai has witnessed success in the Indian market. Hyundai has established its unique Fluidic Design Sculpture as the design direction under the global modern premium brand image. Taking cues for its global flagship products, Hyundai has incorporated the designs into Indian products.